In 2015, American Family Insurance (AmFam) launched a strategic initiative partnering Corporate Finance and Information Services divisions to improve IT intelligence and deliver better IT investment decisions. 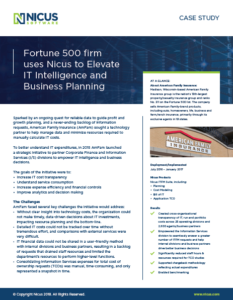 At the time, the AmFam team was logging extensive overtime, working nights and weekends to manage information requests from business partners and perform critical total cost of ownership (TCO) studies of existing applications. Consolidating Information Services (I/S) expenses in response to TCO requests was manual and time-consuming, preventing deeper analysis.